Last week our second grade boys traveled to the Metropolitan Museum of Art to build on their knowledge of the American Revolution. To prepare for the trip, the boys have been studying how New Amsterdam eventually became the New York Colony and why the colonists were upset about a remote monarch ruling over their land. At the museum, boys visited the American Wing, where they critically analyzed Emanuel Leutze's 1851 painting Washington Crossing the Delaware. Getting our boys out of the classroom through field trips such as this, which amplify and deepen their learning, is something we've been focusing on at Saint David's throughout all grades. 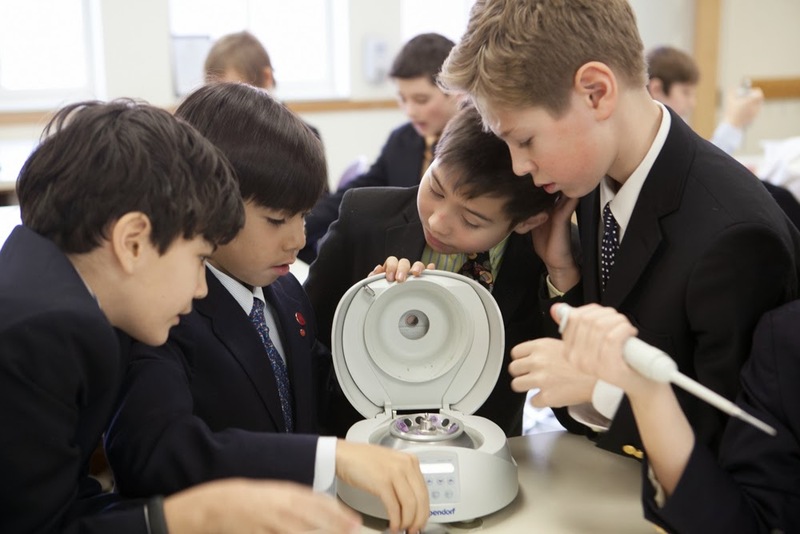 Next week, our fifth grade boys will be engaged in hands-on work in a forensics DNA Lab located in the city, our sixth graders will be at the N-Y Historical Society examining the Gilder Lehrman Collection, a unique archive of primary sources from America's past, and our eighth graders will be heading off to JFK International for their 10-day Italian Study Tour. All of these experiences are important outside components of comprehensive interdisciplinary units of study. We are fortunate to be in a city that offers myriad opportunities for us to "break down walls of the classroom" and Saint David's boys are taking full advantage of it! Squeals of excitement could be heard in the lobby as boys and parents reconnected with one another and their Horizons teachers on our recent Horizons Reunion Day. The boys, now either first graders or second graders, enjoyed a typical Horizons day on Reunion Day this past Saturday, a combination of class work, sports, music and free play. They were also assessed by their teachers, who evaluated their progress in academic skills since last summer. Saint David's Horizons boys were thrilled to be with their summer classmates and with their teachers Courtney Sanchez, Meghan Patterson, Leah Kaplan, Melissa Ferrer, Lindsay Buhr, David Bell, Jorge Roman, Keith Williams, Amanda Rathbun and Nieve Gonzalez. Horizons boys with 8th grade volunteer Luke R.
Several of our current Saint David's eighth graders volunteered their time and helped out with sports, lunch, and playtime. The day also included a series of informative lectures for Horizons parents on the following topics: "Food and Nutrition," "Enrichment Activities," "Reading to Your Children," and "The Importance of Physical Activity for Boys." The lectures were delivered by Melissa Roessler, a current Saint David's parent and certified nutritionist; Tori Gilbert, Languages Chair; Kim Davidson, Lower School Head; and Pedro Morales, Saint David's Director of Athletics. The day culminated with everyone enjoying a pizza lunch and ice cream sundaes. Smiles abounded. It was exciting to witness our Horizons community continue to grow and thrive with incredible support from our Saint David's teachers, staff, boys, and parents, and through the dedication, guidance and exceptional leadership of Executive Director Julie Sykes. Horizons at Saint David's is a six-week summer program to prevent academic summer slide in at-risk boys that we began in conjunction with our 60th anniversary celebration as a way to contribute to the greater common good. We have partnered with public, charter and parochial schools in East Harlem. The program was launched in the summer of 2012, with just one class of rising first graders. Come this summer, we will add another cohort of 15-17 rising first graders to the boys currently in the program, bringing the total to 50. I had the great pleasure of visiting Theo '10 for lunch and a tour today at Rye. We reviewed his transition to Rye from Saint David's, his experience at high school in general and any ways that Saint David's may be able to further improve the experience of our boys based on Theo's critical reflection. We had a spirited exchange. What fun to catch up! Theo graduates from Rye this year, matriculating to Vanderbilt. He continues to excel on the golf course. Now ranked 14th, Vanderbilt is thrilled (click link) to have him. The last Saint David's boy to attend Rye for high school was Daniel M. '07 who then matriculated to Drexel. It was great to catch up with Theo before he heads off to college. Nashville is lucky to have Theo. Yesterday was the day Saint David's fifth grade boys had been eagerly anticipating! 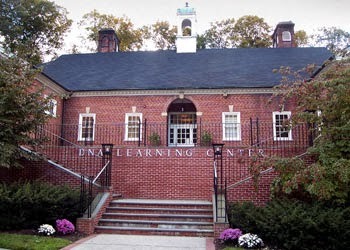 The boys, along with a cohort of their teachers, traveled to the DNA Learning Center's research facility in Cold Spring Harbor for a full day of hands-on work extracting and analyzing DNA at the prestigious laboratory. 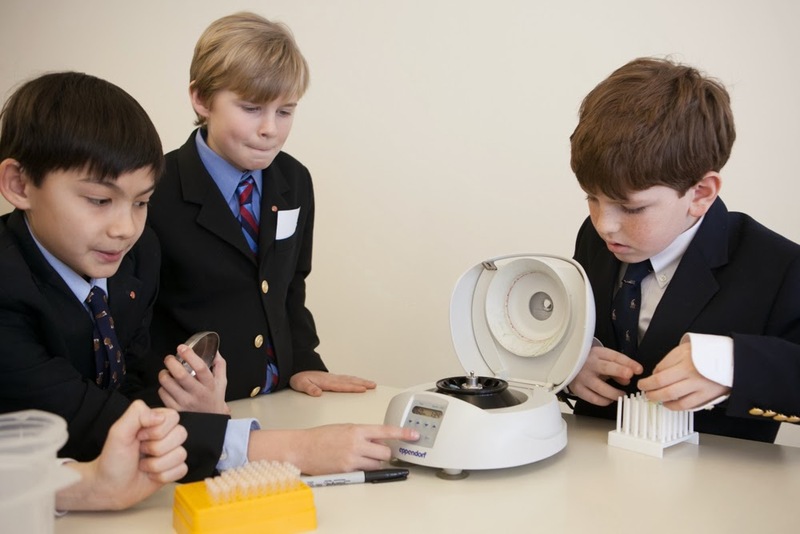 The boys worked with professional-grade lab equipment to solve a "DNA mystery." They were given a sample of one plant that is known to have life-saving medicinal properties, but is very hard to cultivate. They were also given three other plant samples and asked to determine, based on their extensive DNA analysis, which of the three was most closely related to the cure-all, and therefore, the most likely to share its medicinal properties. Working in pairs, each fifth grader practiced following the steps of a lab protocol to carefully isolate and extract DNA from the leaf sample, amplified the DNA using PCR (this process makes billions of copies), and then loaded their DNA samples into an electrophoresis gel, and then interpreted the results. Some of these bio-tech processes need time to sit and "cook." 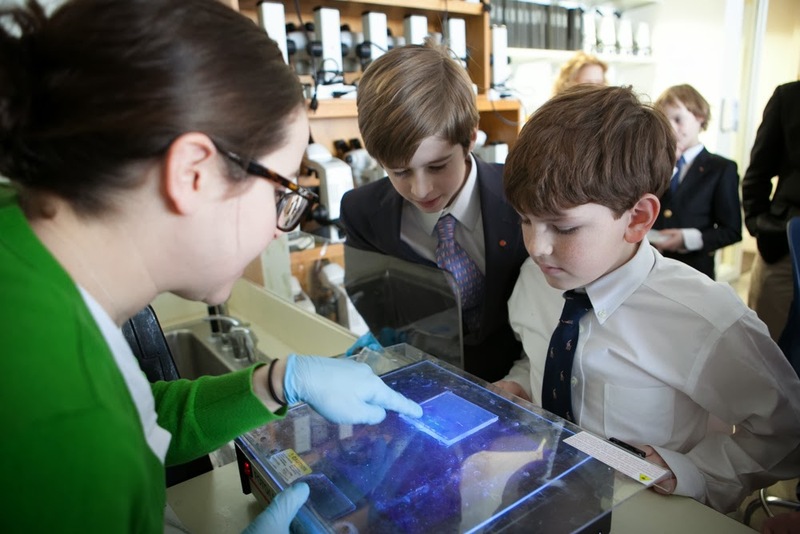 During this downtime the boys enjoyed lunch, explored the learning center's hands-on DNA exhibits, and sat down for a colloquy with research scientist Dr. Mona Spector, who has spent her career studying the ways cancer cells disrupt and change DNA sequences. Identifying genes that are frequently mutated as cancer advances might identify good "targets" for therapy. The boys were thrilled to participate in this day of learning, and the questions they asked were thoughtful and probing. It was most exciting for them to see how the science work done in a lab relates to real life issues and concerns, and has the potential to do great things like identify cures for diseases. This type of connection-making is very powerful and will "travel" back with our boys to their science labs at school in the form of increased understanding as they continue their study of DNA this term in our partnership with the DNALC. The boys' visit yesterday was just one component of this signature unit of study in our innovative fifth grade program. Later in the year, when fifth graders take on their own "DNA Barcoding" projects, they will use the same techniques they learned about, experimented with and employed yesterday; but this time, they will answer a question of their own design. This is active, critical learning at its finest. Our second grade boys took the lead as teachers yesterday. In a special culminating Exhibit, the boys presented projects they had completed and learning activities they had engaged in related to the evolution of New York City from Lenape lands to Dutch settlement to thriving metropolis. This 'performance of understanding' was the conclusion to months of joint in-depth study with their teachers and archivists from the N-Y Historical Society. Parents and faculty were invited to learn from our boys as they displayed their Lenape totem poles, wigwams, colonial still life paintings, replicas of Fort Amsterdam, and their portfolio of work. All year, the second grade has been exploring the evolution of New York City over time while it maintained a constant connection to its historical heritage. This Signature unit of study, (defined as such because of our joint work with an outside cultural institution), is one of several that now feature prominently in the Saint David's School curriculum. During the course of their study, the boys built wigwams and longhouses alongside the Lenape tribe and compared them to homes of their own. They visited Inwood Park where they examined a real wigwam. The boys traveled with Henry Hudson on his ship the 'Half Moon' as he explored the Hudson Valley and they envisioned Manhattan in the year 1609. They’ve planned and plotted as they reconstructed the Dutch settlement at New Amsterdam using old maps, and they learned such facts as how Wall Street got its name. Yesterday, it all came together and the boys were brimming with confidence and excitement, eager to share their insights while gaining valuable practice in public speaking and presentation skills. In answering thoughtful questions posed by visitors, the boys also had to dig deeper and explore "the why" question that is at the center of our critical analysis theme of the year. 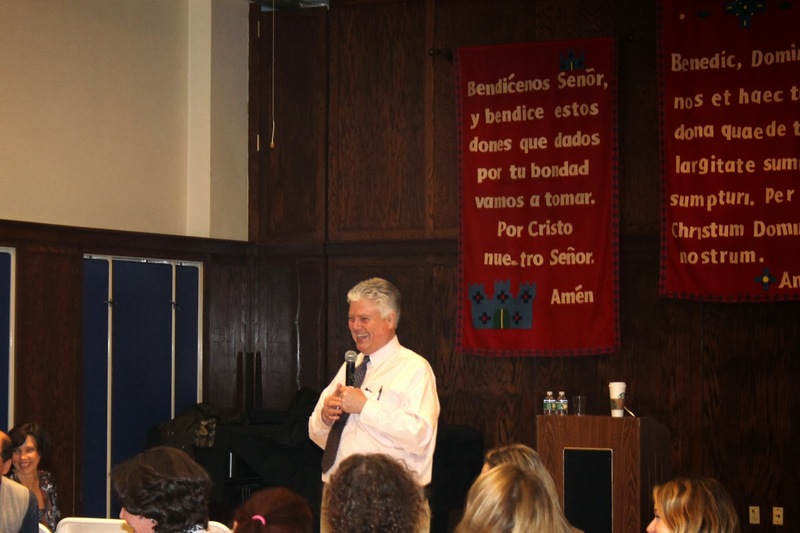 Last week in a Parents Association sponsored event, Dr. Edward Hallowell, child and adult psychiatrist, and bestselling author of more than twenty books, including The Childhood Roots of Adult Happiness, spoke to parents at Saint David's about the extreme importance of meaningful connectivity in childrens' lives. 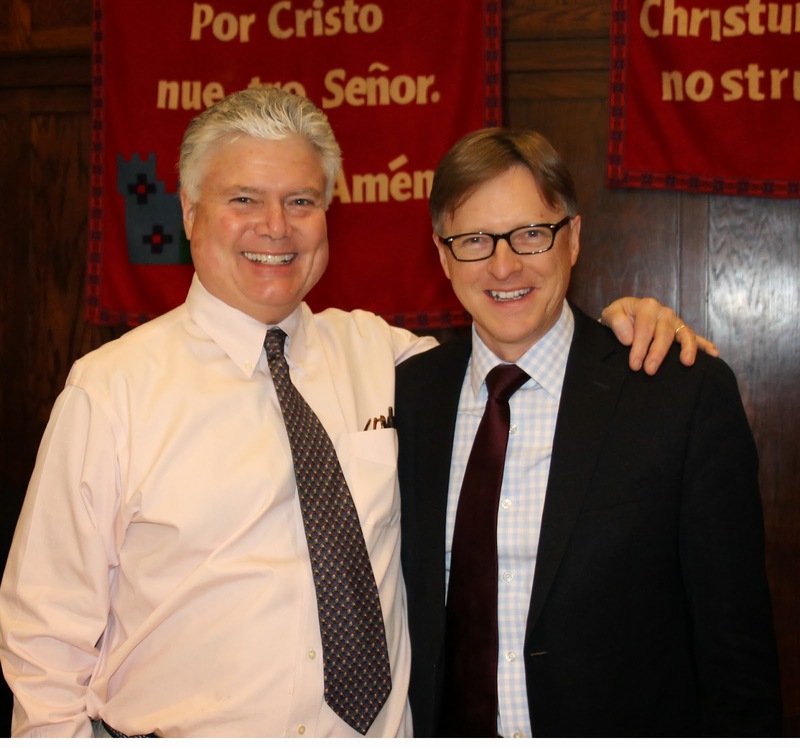 In an era when we primarily speak of connections in an online sense, Dr. Hallowell urged parents to "saturate your child with positive connections" that go beyond the digital. His recommendations and messages included advising parents to model how to be a good friend through the cultivation of their own friendships. He also spoke about the superiority of in-person friendships to those that are primarily lived online, and how important it is for children to feel connected to nature, to an activity or team and with others who have similar interests. By exposing them to a broad range of people, organizations, and institutions, children have a greater opportunity to discover a latent passion. This is a key. That we live in a digital world is a given, but Dr. Hallowell stressed that electronic use by children (and adults) needs to be moderated, likening it to excessive eating (or other habits or even addictions) if left unchecked. At Saint David's, we recognize the necessity of a boy's feeling connected and a valued member. 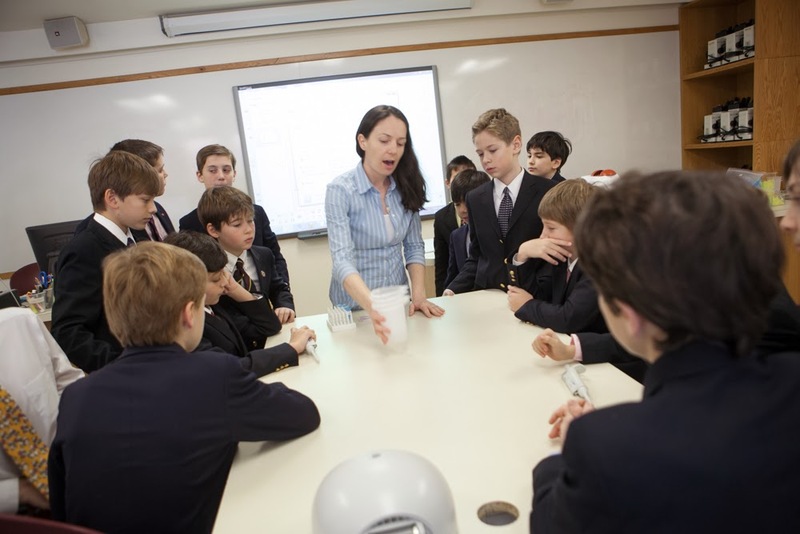 We emphasize the importance of connection-making, whether through collaborative academic/artistic projects the boys engage in, our family-style meals, daily Chapel, the sportsmanship that is stressed in our athletics programs, the community service we do in groups, our buddy programs, and the vast array of tradition and ritual that defines a Saint David's education. We cannot, however take any of this for granted. It is something we must continuously reflect upon, critically evaluate, and then further evolve. Helping boys make connection is never done.